Beaumont machine, for digging tunnels into soft rock. 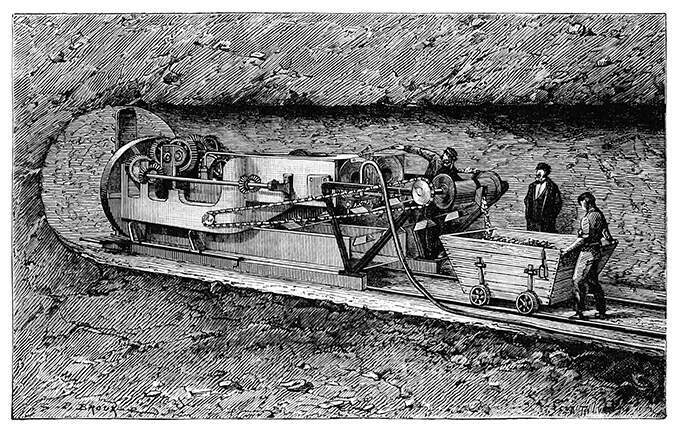 View of the Boring machine designed by Frederick Beaumont in action on the French side of the first attempted Channel Tunnel. 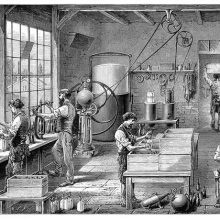 The shaft was rotated by a two-cylinder engine powered by compressed air. This device was successfully tested in the Channel chalk. In 1878-79, drilling started on both sides of the Channel, at Sangatte on the French side, and at Shakespeare Cliff near Dover. In April 1883, despite talks on the English side to abandon the project, work was apparently still under way. It finally stopped around July of the same year, mostly due to the British military establishment fearing the tunnel would put the island under constant threat of invasion. Between 5,000 and 6,000 ft (1,500 and 1,800 m) had been dug out on each side. 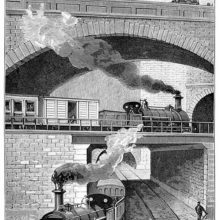 The caption reads in the original French: Machine Beaumont pour le creusement des tunnels dans les roches tendres. 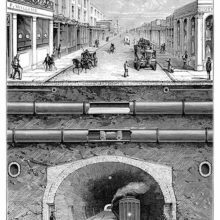 On the abandonment of the first Channel Tunnel, one can read the 1992 thesis titled The Channel Tunnel Project 1871-1883: a Study in Public Sector Mismanagement submitted by Robert Bryce Culham to the University of Alberta.